Crocus Vernus Pickwick in my back garden today. I like the colours and patterns on these. Oooo, very pretty, sort of stripey! Those are a bit special! Thanks TT...I saw these yesterday and wondered about the name......Fabulous ( Awsome) photo BTW. Who took it...Conker or Truff ? Thanks... :o) Glad the name is helpful. Crocus budgie took this pic of his namesake (Crocus) .. He likes these digital cameras .. hover overhead ..
Hello Surreylad ... Thank you ..
oh, lovely! how the heck do they (presumably) take a purple crocus and a whilte one and get 'em to line up so neatly?? lol but working with living material this time, at least I hope my toothpaste isn't alive and growing! can we hope for more pics later?? Really beautiful, Terra, unfortunately, the squirrels eat our crocuses, so I don't buy them anymore. That's a pity the squirrels eat your crocuses.. This is my favourite crocus variety .. I just pick up the camera and point ...LOL..
Next year, I bet you'll have crocus bulbs everywhere ! Or maybe treat yourself to some Premium Bonds ? lol they did a survey, TT, and the odds on winning big on Premium Bonds are about a hundred times higher than winning the lottery, and they're high enough! you only need to buy one ticket, Kasy, but of course it has to have all the right numbers on it. 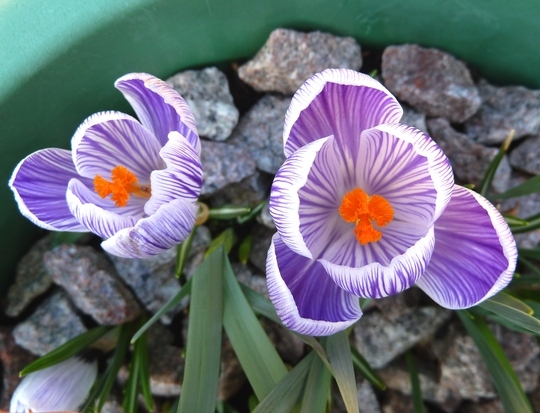 Lovely photo of a very beautiful crocus, spring flowers are such joy! Amazing, and very colourful, thankyou. Hi Tony and Tiny... Thanks. What a gorgeous crocus Tt, such lovely markings on the dainty petals. Fabulous shot too! Gone onto my Favs. I'm really pleased you like this one. I have some Pickwick from last year (such as this one) and some which were new bulbs this year..